It is no secret we tend to be a little unorthodox when it comes to our preference of vehicles – we are suckers for the mid-sized family sedan. Strange? Yes. However, the mid-sized sedan is the back-bone to auto makers that holds everything together. They are the average car for the average household. Take the Toyota Camry for example, it currently holds the number one spot as the top selling sedan on the market, and for 2015, its competitors should be nervous over their next quarterly figures. 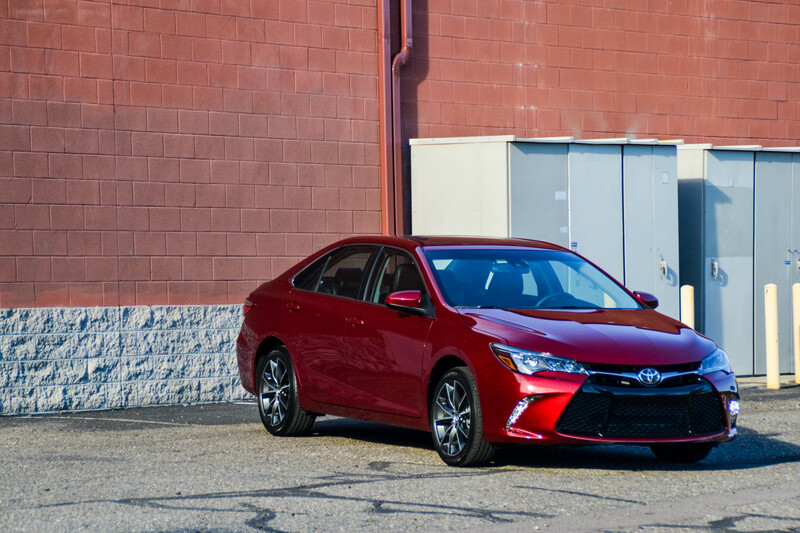 For 2015, Toyota updated the Camry considerably by adding over 2,000 new parts and new body panels (apart from the roof) for a much bolder Camry. Offered in multiple trim levels and hybrid options, there is a Camry for any household’s budget. However, our tester this week is the all new XSE trim that offers premium features while exuberating a sportier tuned sedan. Already starting with an aggressive attitude, our sampled sassy Ruby Flare Pearl Camry was ready to hit the road and start showing off its new intense personality. There is much to like with the new Camry, and its XSE trim. The Camry fulfills an alluring sporty side with a large, black honeycomb grille, LED Headlights with a black housing, LED Daytime Running Lights nestled in the lower fascia, and 18” black accent wheels. It’s by far the first sedan we’ve driven that has left pedestrians pointing and stunned that this was the new Camry. But let’s not forget, while we may have a couple of rug rats nestled in the back seat, we’re still drivers, and our sampled XSE came equipped with Toyota’s optional 3.5-liter V6 engine. Matted to a six-speed automatic, 268 horsepower and 248lb-ft of torque emitting a rambunctious grunt, the Camry will put on a good thrill ride getting you from zero to 60 in just under 6 seconds. And with the use of the steering wheel paddle shifters, things get much more enjoyable – at least on those days you’re running late on the office carpool. Of course opting for the larger, more entertaining V6 does damper the fuel efficiency. Toyota rates the Camry at 21/31/25 (city/highway/combined). During our week we recorded a little lower than that, averaging 20.6 mpg on regular unleaded fuel for about 350 miles of range. Part of the 2015 update included some additional spot welds to the Camry’s chassis which makes it stronger and able to handle more road abuse. Even though ‘sport’ is in its vocabulary, the Camry is not your Flintstone styled ride. The suspension has been re-tuned over the previous model which allows for a firmer ride without sacrificing too much comfort. The electric power steering was tweaked to enhance the drivers experience with better feedback and responsiveness. These minor tweaks allows the Camry to showcase a more flamboyant driving styled that can absorb the punishment. While we’re not typically fans of black interiors, the XSE suede and leather trim combo with red stitching is different and adds a pleasant contrast. The design of the dash is simple, classy using a good use of silver trim and soft touch materials with matching red stitching – the layout is traditional sedan-like which makes for easy access to all of your entertainment and comfort needs. This of course makes for a relaxing, accommodating cabin – the seats are comfortable for long journeys, and the rear seat provides decent leg room, thigh support, and plenty of head room. The Camry prides itself in passenger comfort and amenities featuring power adjustable heated front and passenger seats, Dual Zone Climate Control and a new Wireless Charging Station (if your phone is equipped). There is no shortage of new available technology and driver assistance packages in this latest Camry including Blind Spot Monitoring with Rear Cross Traffic Alert ($500), Navigation with App Suite ($805), and the Technology Package (Pre-Collision System, Lane Departure Alert, Dynamic Radar Cruise Control, and Automatic High Beams ($750)). Even though we may enjoy most mid-sized family sedan, this new Camry is one we wouldn’t mind taking home. Being that the Camry is not only great looking, fun to drive, and an extremely comfortable place to be stuck in traffic with; its something we find that just about anyone can enjoy. Good article! Did you actually run the 0 to 60 mph test, and get less than 6 seconds or quote it from another source? Thanks for your comment Paul! We run the 0 to 60 test ourselves but it consists of a stop watch and a freeway on ramp since we don’t have the resources to test them on a track. If an automaker quotes a 0-60 on their site, we’ll quote them. Sure James! So am I correct in thinking you did actually test the 2015 Toyota Camry V6 yourself, and got just under 6 seconds. And it’s not a quote from another source? Yes that is correct. We usually run our tests on Saturday mornings during low traffic times, we’re not the most technically advance with the proper equipment but we used a simple stop watch and ran the test 3 times. I’d have to go back and check my notes, but if my memory serves me, I think we pulled a 5.8, a 5.9 and a 6.2 time. There are certain cars we do pull from other sources due to their high performance specs and don’t want to rouse any trouble on the public streets.